I once lost a portion of a security deposit on a college apartment because my roommates and I hadn’t cleaned the oven before vacating the premises. (Never mind the black mold the landlord let multiply unchecked in our bathroom or the half-rotted wooden staircase they should have repaired or the fact that the oven was abysmally gross when we arrived—we didn’t clean the oven; we lost $75.) We didn’t clean the oven because, in shameful millennial fashion, I don’t think any of us knew how to clean an oven. In even more shameful fashion, I didn’t learn to clean an oven after that, either. I just scooped up the large bits of charred food and figured it was good enough. Gross, I know! Mom, Dad, I’m so sorry, you did raise me better than this. After my holiday goose-cooking success, though, there were no two ways about it: my oven needed cleaning. Stalactites were forming. Geology was occurring inside its walls. The time had come, a long time ago. In the spirit of The Takeout’s micro-resolutions—spending a quick 15 minutes learning to do a small kitchen task more effectively—I bit the bullet. Yeah, you could basically eat off my oven floor now. As with most basic cleaning duties, once you start the damn task, it’s actually not so bad at all. I watched a few YouTube videos, read up on the various products that existed. But being something of a closeted granola-crunchy hippie, I ultimately decided against the chemical sprays and exploding oven bags in favor of the two substances that can clean 90 percent of home messes: vinegar and baking soda. Loosely following this guide from The Kitchn, I removed the oven racks, snapped on my rubber gloves, and removed the big chunks of charred stuff first. Then, I mixed the paste of baking soda and water, using about 3/4 cup of baking soda and enough tap water to make it spreadable but not drippy. With a paper towel, I smeared that all over the insides of my oven. Brown crusties were already loosening up. For good measure, I spread that paste on the racks, too, which I let sit in my kitchen sink. I let the paste hang out in the oven and on the racks for an afternoon (about four hours) before I began step two: Wiping all that junk away with a towel. This actually got rid of most of the crap, to my surprise. What was left was annihilated with just a few squirts of regular white vinegar from a spray-bottle. The vinegar began to foam in contact with the baking soda, like Scrubbing Bubbles do in the commercials. I was able to wipe the rest of the gunk off easily with a towel. That was it! All the complicated products and self-cleaning cycles are just out there to trick us, people. 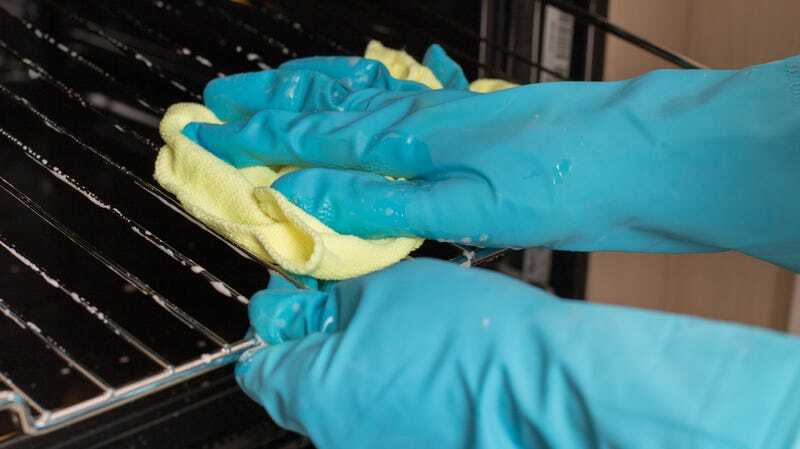 Cleaning an oven is as easy as mixing a paste and spraying on some vinegar. Equipped with this knowledge, I’ll never let my oven go years between cleanings again. I am a new, better woman. Happy 2019, everyone.